Sharks Antibes (ProA) signed 28-year old American (has also Nigerian passport) center Chris Otule (211-125kg-90, college: Marquette). It is actually his comeback to Olympique Antibes as he has played here before. Otule played last summer at Guizhou Senhang in Chinese NBL league. He managed to play in three leagues in two countries last year. 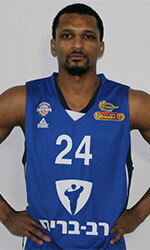 In 31 NBL games he had very impressive stats: 21.7ppg and 14.3rpg (#5 in the league). Great season as he was named to Asia-Basket.com All-Chinese NBL Honorable Mention. The most of last season Otule spent at Gravelines Dunkerque where in 24 ProA games he recorded 5.1ppg and 2.0rpg. Otule also played for SIG Strasbourg that season. In 5 ProA games he averaged 5.4ppg and 3.2rpg. He also played 2 games in Basketball Champions League where he got 4.0ppg and 2.5rpg. Otule has played on three different continents (Europe, Asia and of course North America). He has played previously professionally also in Germany (Mitteldeutscher BC and Crailsheim Merlins) and Turkey (Mersin Buyuksehir Belediyesi). Otule attended Marquette University until 2014 and it will be his fifth season as a professional player.